Game of Thrones Flowchart UPDATED! Most of you have probably seen this, but I updated some pictures in my Game of Thrones Flowchart, so I’m reposting it. (No spoilers!) I also realized I haven’t made a flowchart in too long… need to think of something (feel free to send me any ideas you have though!). *Source material and inspiration taken from George R.R. Martin’s A Song of Ice and Fire series. This entry was posted in Flowcharts and Graphs, Nerd Things and tagged a song of ice and fire, carton, flowchart, game of thrones, george rr martin, humor. Bookmark the permalink. 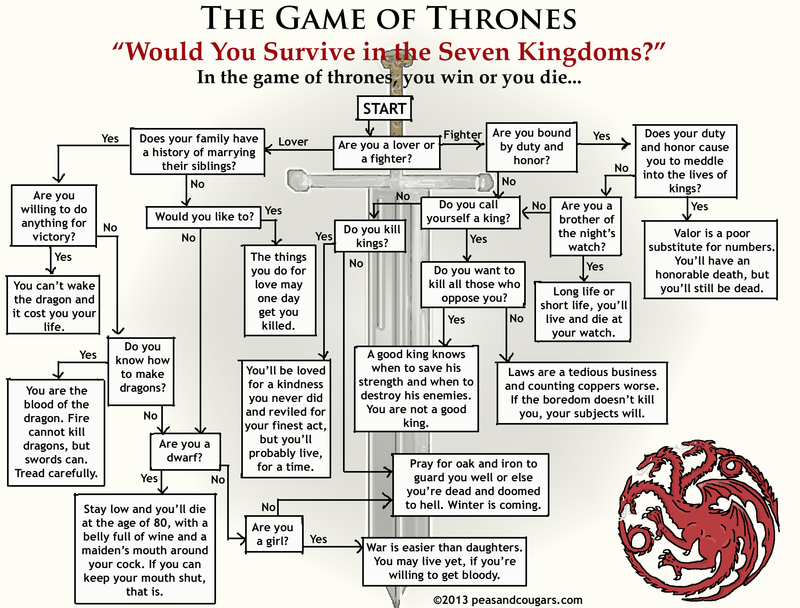 8 Responses to Game of Thrones Flowchart UPDATED! I love it! And no, I would not survive.